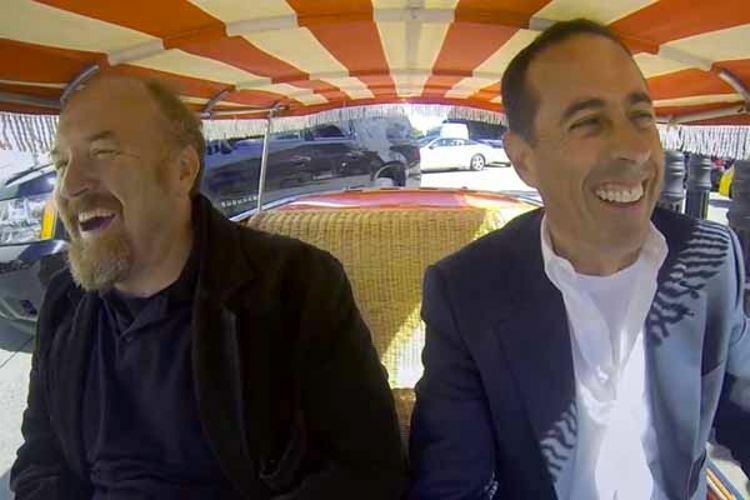 Comedians in Cars Getting Coffee, Jerry Seinfeld’s clunkily titled web series, is back for a third season with a Louis C.K. premiere. Info obtained: Louis says he’s mulling seven or eight seasons for Louie, Steven Wright hung out while C.K. wrote some new episodes, and C.K. only values two earthly pleasures more than a stoned trip to see a 3-D IMAX movie. News bits aside, though, it’s just nice watching these guys spend some laid-back time together. They should really do this more often, shouldn’t they? Here’s your first look at Guardians of the Galaxy, complete with Chris Pratt, a green Zoe Saldana, and the space-raccoon. And here is your first look at Christian Bale as Moses in Ridley Scott’s Exodus. “Danielle Steele Receives France’s Highest Honor.” That’s all. So many mellow-harshing arrests at Phish’s four-night stand at Madison Square Garden. Someone ate only at Starbucks for a year without transforming into a stale, mysterious treat that may or may not have been a scone. Coinye West. Try — just TRY — to guess what you’re getting into before you click that. Bright Eyes dude Conor Oberst auditioned for the lead role in Inside Llewyn Davis, as he tells Inside Llewyn Davis star Oscar Isaac while interviewing him.